February 5, 2016 - On Friday about 3:30 PM, two small aircraft collided midair over the water off of San Pedro, California. The Coast Guard reported that two tail numbers, one from each aircraft have been recovered and confirmed by the Federal Aviation Association. According to the FAA, the aircraft have been identified as a Beechcraft 35 Bonanza and the other a Bellanca Decathlon 8KCAB a aerobatic stunt plane. Both aircraft were based at Zamperini Field, Torrance, California. It is believed that two men were aboard one aircraft and one woman aboard the other aircraft. Capt. Jennifer Williams with the Coast Guard said the occupants were from South Bay and their ages ranged from 61 to 81 years old. "We Found debris and other materials. We found a log book of one of the pilots that helped us ascertain that there would be two people, two male passengers in one of the aircrafts." FAA radar help to identify the 72-year-old female pilot when it was reported the aircraft was late and overdue for landing. The fire department reported there was a debris field near Cabrillo Beach, San Pedro and Long Beach. 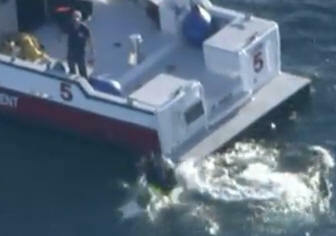 It was further reported by a nearby fishing boat that the aircraft went down in about 80 feet of water. Divers have been sent out in the 60 degree waters and the Coast Guard have set up setup a search area of 200 square miles. It appears that the pilots had flown out to Los Angeles Harbor Light, also known as Angels Gate Light lighthouse which was built in 1854, it is a popular attraction for sightseeing pilots. As of Friday night no survivors were located. Update - The pilot of the Bellanca Decathlon 8KCAB aircraft, has been identified as 72 years old Mary Falstrom of Torrance. The acrobatic aircraft was built in 1979, it is Model 8KCAB and its tail number is N5057G. It was reported by her husband that she was a former airline flight attendant and has been piloting small aircraft for over 25 years.